UBC nursing student Christine Gregory and medical students Alison Leighton and Robyn Buna work to solve a patient emergency in the Pritchard Simulation Centre. UBC Okanagan nursing and med students are training side by side for the first time. Medical students start work in the clinical setting in their third year, and this is the first, third-year class from UBC’s Southern Medical Program to have an opportunity to work in hospitals and clinics in BC’s Interior. 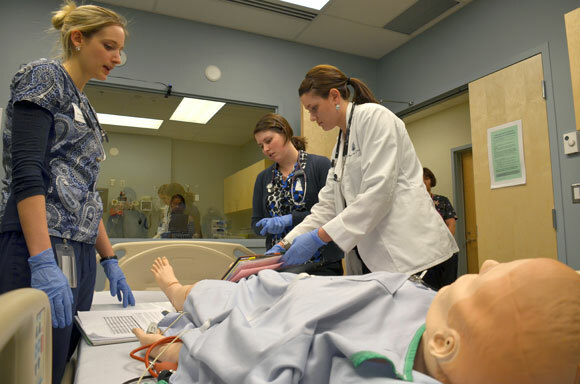 Recently, students from both UBC’s Faculty of Medicine and the Okanagan School of Nursing collaborated for clinical training at the Pritchard Simulation Centre at the Clinical Academic Campus at Kelowna General Hospital. Using patient simulators for emergency treatment case scenarios, Code Blue teams were assembled to assess high-tech artificial patients suffering health crises. The computer-programmed, life-like teaching simulator breathes, opens his eyes, speaks, groans, coughs and displays symptoms mimicking the unpredictable events that can routinely occur in a hospital emergency ward. Beeping monitors display faltering or improving life signs, depending on the patient’s medical condition. There are instant decisions to be made about treatments and medications, with team members relying on each other’s expertise and quick assessments of the patient’s condition. Students have high praise for the joint exercise, recognizing that doctors and nurses have a wealth of vital expertise to share. School of Nursing instructor and laboratory and simulation coordinator Jasmine Clark says the exercise has immediate gains for students. 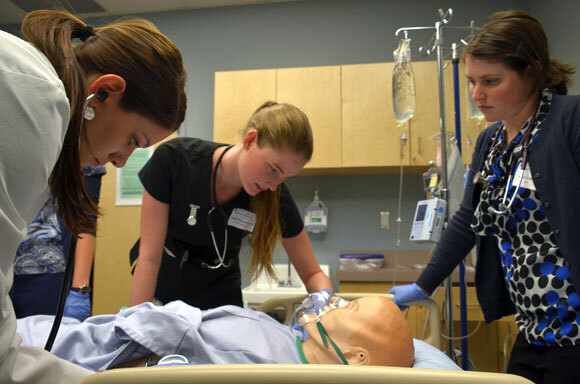 “To have the nursing and medical students work together makes perfect sense in a simulated environment before they’re out doing the real thing,” says Clark. Fourth-year nursing students say the value of teamwork cannot be underestimated. The two faculties expect to collaborate in other areas of joint clinical training as well. UBC medical student Robyn Buna, nursing student Bobbi Bennett and medical student Alison Leighton work to solve a patient emergency while Karen Whaley, Pritchard Simulation Centre clinical educator watches the situation unfold.